Property investors today are not confined to investing in their own country. In today’s globalised economy it is in an investor’s best interest to find investments which can offer you the best in terms of yield and profit. In this article we will be looking into why investing in properties in the Philippines can be rewarding for you. Properties like everything else are hinged by a country’s economic performance. The Philippines is a country whose economy has been rising steadily ever since the year 1960. The graph below shows us how Philippines Gross Domestic Product or GDP has risen over the years. The GDP Value of the Philippines averaged at 69.01 USD Billion in 1960, since then it reached an all-time high of 291.97 USD Billion in 2015. What’s more rappler.com reports that the GDP of Philippines has grown to up to 7% in the second quarter of 2016. The Philippine economy continues to grow and shows no sign of slowing down anytime soon. This percentage represents the Gross rental yield for apartments that are 120-sq. m and located at premier city centers. Philippines currently has a population of over 100 million, 44% of whom live in urban settlements or the major cities. Many local Filipinos continue to migrate from rural area to urban areas like Metro Manilla, Cebu and Makati City due to the prospects of better paying jobs, education and healthcare. This has resulted in an increased demand for houses and condominiums in the urban areas which in turn has resulted in the steady growth of the need in rental properties, and a healthy rental yield for investors. Philippines is a rich and diverse country filled with exciting tourist attractions which attracts people from all over the world. In July 2016 tourist arrivals reached an all-time high of 560872 people. With so many tourists coming in they are going to need a place to stay. This also brings along a high yield for short term renting properties with the average condo being 40 UDS to 60 USD per night. The law governing property ownership for foreign investors is very clear accordingly, foreigners cannot own land in the Philippines. They are however allowed to own houses and buildings. According to the Condominium Act of the Philippines, R.A. 4726, foreigners are allowed to acquire condominium units and shares in condominium corporations as long as they do not exceed 40 % of the total and outstanding capital stock of a Filipino owned or controlled Condominium Corporation. This also means that as long as 60% of the condominium corporation stock is allocated to Filipinos and only 40% of the stocks are in the foreigner’s name a foreigner can set up a corporation should they wish it. Once this quota of 40% is achieved, developers will no longer offer the remaining units to foreign buyers. 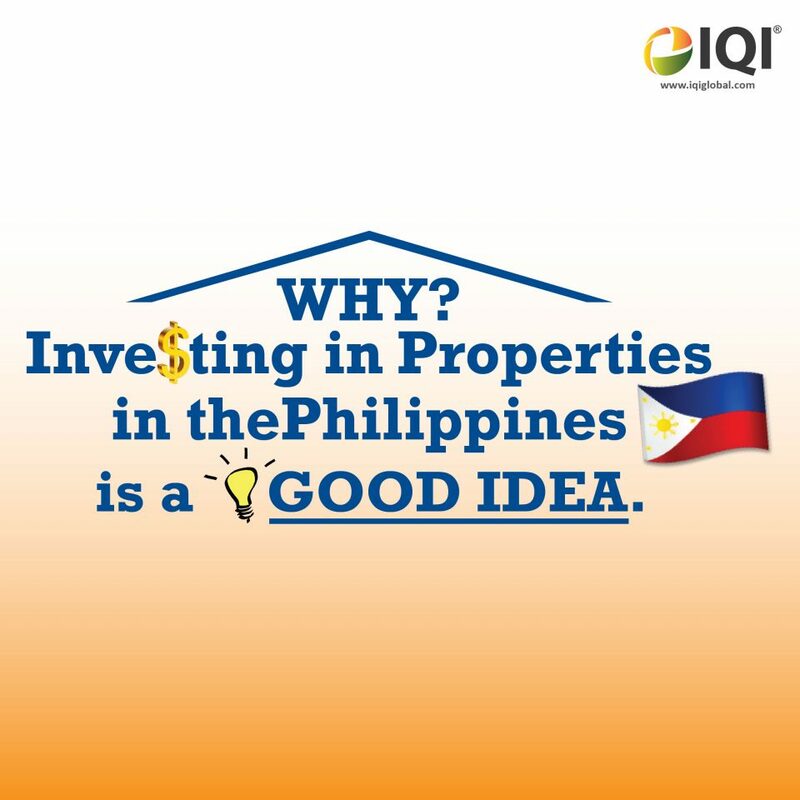 These are some of the reasons why it might be a good idea for a foreign investor to invest in property in the Philippines. In today’s globalised world, property investors can venture beyond the shores of their own country. With the advent of technology, knowledge pertaining to countries economic performances and laws are now available at our fingertips. The Philippines is a young and progressive country with many dynamic demographics and certainly has a lot to offer. It simply makes sense as an investor to take advantage of this opportunity and reap the benefits. We hope that you found this article useful and provided you with useful information to make a wiser choice. There are many strategies that you can implement when investing in a property both foreign and local. To know more feel free to send any questions and queries to hello@iqiglobal.com.